There were many part-time photographers in the Lleyn Peninsula during the early part of the twentieth century and I have already written an article about two of them John Richard Owen, Tan y Groes and Robin John Jones, Chemist, both from Nefyn. There was only one “professional” photographer, that I am aware of, who practiced in the area. His name was Fred May and he had a studio on Ala Road, Pwllheli. Frederick H Mahaffy was born in Belfast, Northern Ireland in 1878. He arrived on the scene in Pwllheli around 1907 with a wife and young daughter. After starting off working from a few houses around town, he later opened a studio at Rathlyn on Ala Road. Nobody knows where he received his initial training but he was viewed as a photographic expert. He had the stellar reputation as being one of the best scenic, black and white photographers in the whole of Great Britain and he often advertised himself as such. “Photographic expert in landscape and reproduction work. Family groups, farms, residences etc photographed. Visitors, residents, picnic or pleasure parties - photographed in any part of the district. First-class work at a popular price”. These were the slogans he regularly used in his advertisements. Photography was a tough business and it was difficult to make a decent living even after the onset of the postcard boom. But Fred May persevered and never gave up on his profession. He would ride around Pwllheli on a bicycle carrying his camera, tripod and associated equipment from place to place. 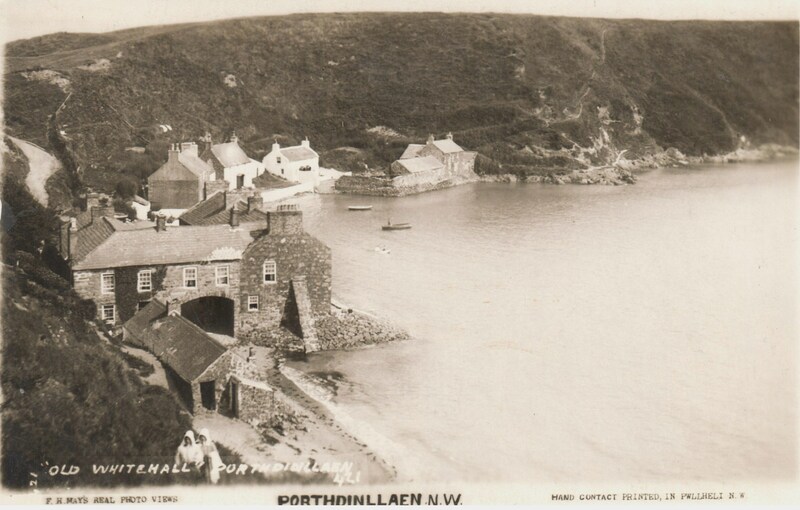 He would take scenic photographs around the whole Peninsula as well as the greater Arfon area. He initiated a series of black and white postcard photos showing the way of life in the Lleyn villages and towns. He encouraged local people to participate in those postcard shots. The quality of his photographic work was second to none. He was reportedly nearly blind in one eye and this made his mode of living and his persistence at it just the more praiseworthy. During the fifty plus years he lived in Pwllheli, as well as taking a large number of photographs in the postcard series, he also took a multitude of portrait photographs in his studio, under the lights and with an array of artificial backdrops. He was not very organized individual. He used to identify his photos by scratching a number directly on to the negative and the number appeared haphazardly anywhere on the print. Likewise his name and address “Fred May, Ala Road, Pwllheli, NW” was scratched on some photos but was omitted on others and some had his name in a scrolled ribbon insignia in the lower left corner. Others were not named or numbered but had the unmistakable May quality. He chose not to advance to coloured printing, preferring to stick with the black and white format. Some people criticized his photos as being too dark. Others highly praised his work, with the black and white format superbly capturing the dismal and sombre nature of the life of ordinary people in Lleyn at the time. His own life was unfortunately somewhat sad as well. In 1930, his wife left him to return to live in Northern Ireland. The bright spark in his life was his daughter Kathleen Mary who moved on from Pwllheli to college in Bangor and then became the headmistress of a school in Swansea, South Wales. Throughout his fifty-three years in Pwllheli, Fred May was a faithful member of St Peters Church. He passed away in Gallt y Sil Hospital in Caernarfon on March 23, 1960. 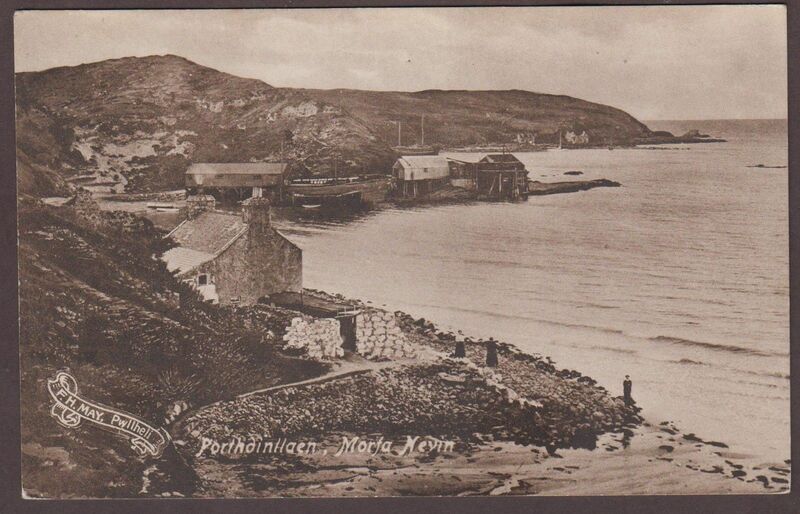 There are several postcard photographs by Fred May already on this website. 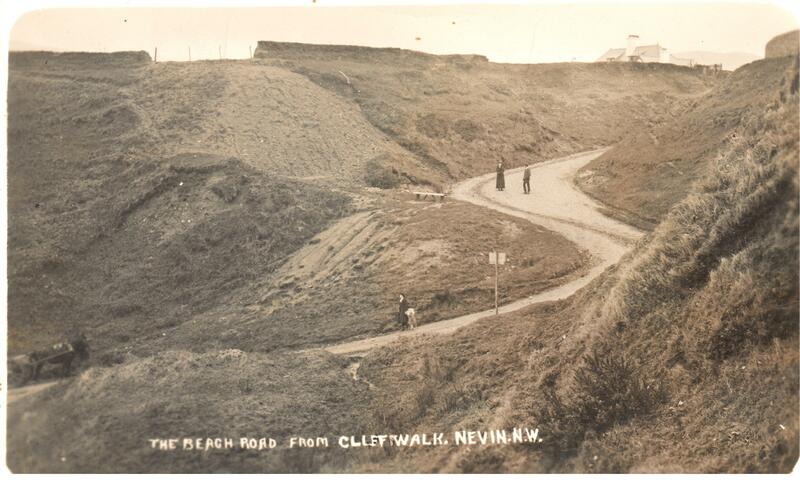 Shown below are a few additional postcards of the Nefyn area from the early 1900’s that are credited to him. A landslide on Screw Road with a donkey and cart just visible on left. 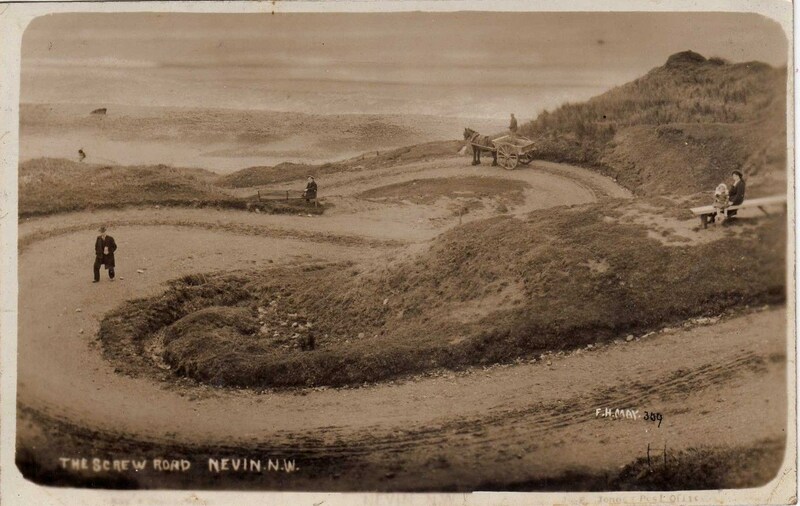 A horse and cart hauler on Screw Road with the horse and cart tracks clearly visible. 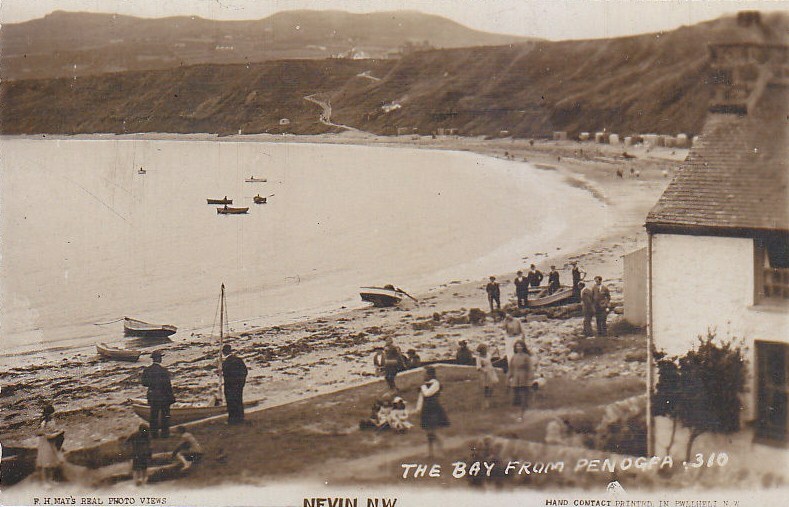 Several important looking men pulling up a boat near Penogfa on Nefyn Beach. 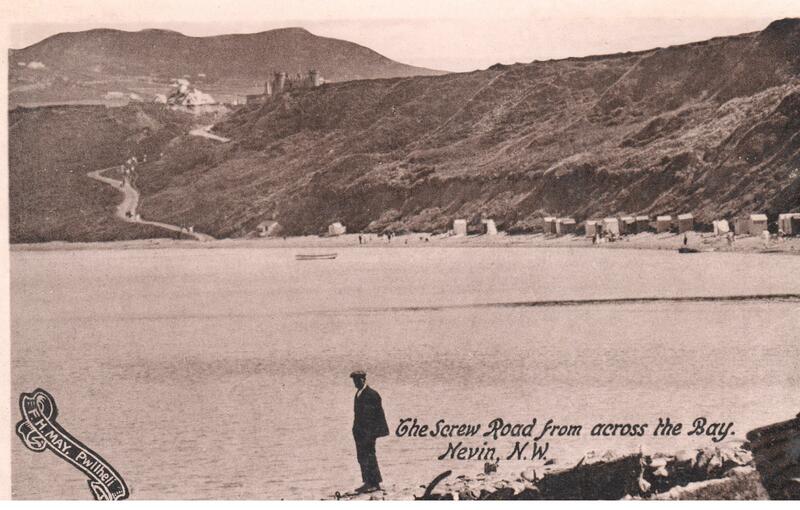 Many people but no buildings on Screw Road viewed from across Nefyn Bay. 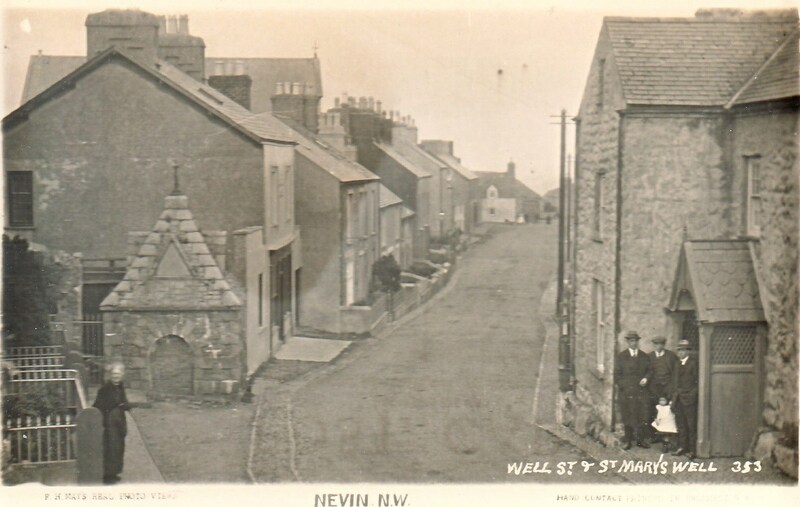 An elderly lady by St Mary's Well on Well Street, Nefyn. Tan yr Allt innkeeper Jeremiah Jones, wife Mary and maid outside the Inn in Porthdinllaen. 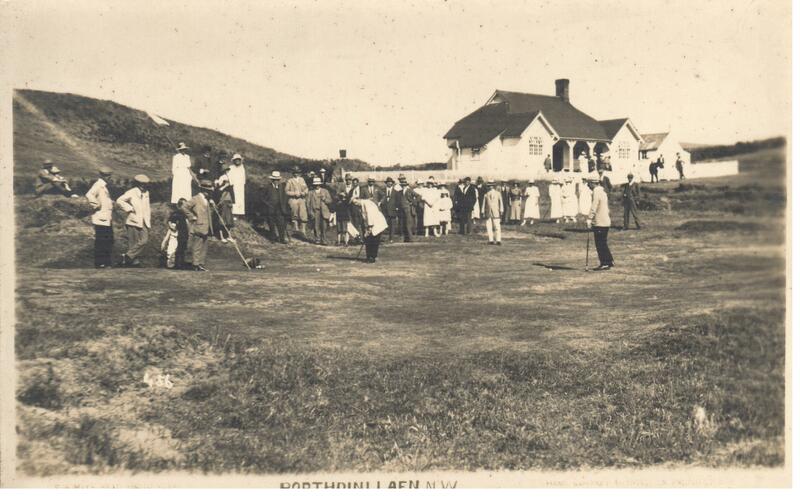 Putting on the 3rd green near the Porthdinllaen Golf Clubhouse. Maids from Ty Coch and Whitehall climbing cliff path from the beach in Porthdinllaen. 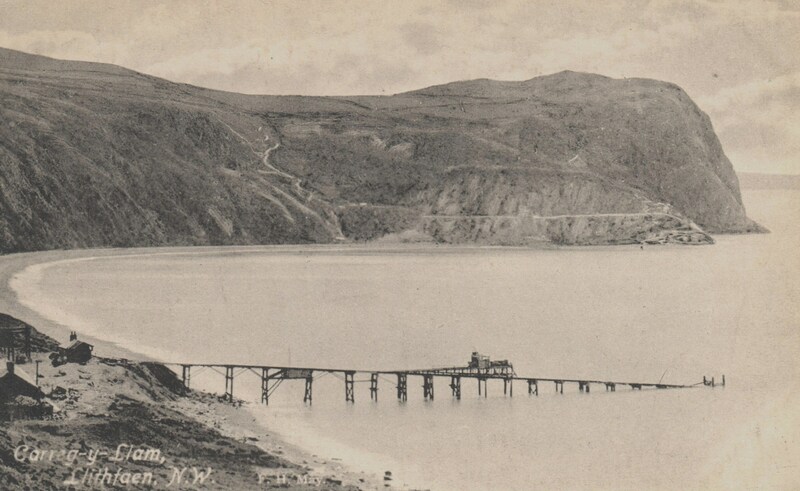 Quarry Pier at Porth Nant with north side view of Carreg y Llam before it was so extensively quarried. 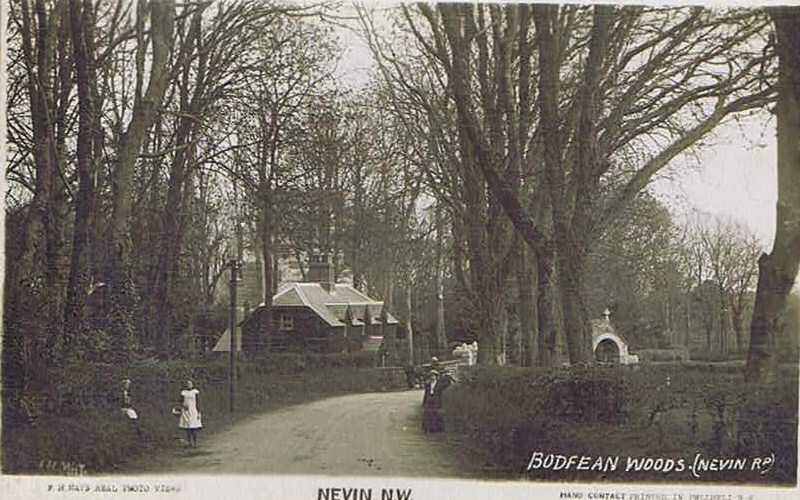 Bodfean Woods by the Church on the Nefyn to Pwllheli Road.